The Bangladesh Cricket Board (BCB) has not yet received a response from former South African allrounder Lance Klusener, who was a leading candidate for the role of the team's bowling coach. 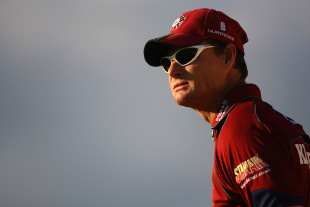 Klusener was supposed to join the Bangladesh team in the first week of September but that now appears unlikely, according to a report in the Daily Star. "We must go for other options if we don't get any response from him by today," BCB's media committee chairman, Jalal Yunus, said. "We will consider Andy Caddick and Venkatesh Prasad for the position as we had them in our list previously." The bowling-coach vacancy arose because Champaka Ramanayake, a former Sri Lankan fast bowler, quit the job due to illness. The BCB had already secured Julien Fountain, who is from England, as the team's fielding coach and he has already joined the team. Bangladesh are presently coached by Australian Jamie Siddons and the board was looking to strengthen the support staff ahead of the 2011 World Cup, which Bangladesh is co-hosting with India and Sri Lanka. Bangladesh's bowling has been a problem area in 2010 with the team conceding totals in excess of six runs per over regularly.